A game by Joymasher for PC, Switch, PS4, and Xbox One, originally released in 2015. 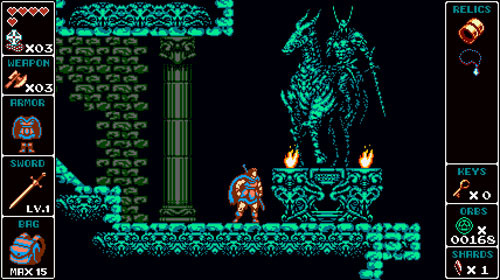 Odallus: The Dark Call takes place in a foreboding land that is slowly being consumed by evil. The old gods have stopped answering the prayers of mankind, and an aged warrior named Haggis (yes, like the meal consisting of sheep innards) must take up the sword once again to rescue his son from these dark forces. 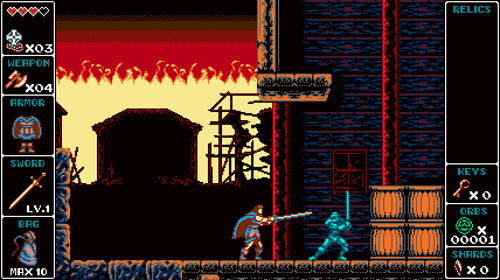 Odallus is a metroidvania, but rather than offering a single contiguous world, it is divided into distinct levels. This is somewhat atypical of the genre, but this structure has been used previously in such titles as Wario Land 3 and Shantae and the Pirate’s Curse. 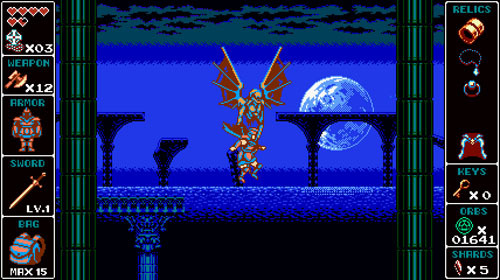 Thematically, the game draws its inspirations from the Castlevania and Ghosts ’n Goblins series, though the level layouts are most similar to Capcom’s unappreciated masterpiece of the macabre, Demon’s Crest. Like Demon’s Crest, levels are layered and nonlinear, with multiple paths to explore, alternate routes through many levels, and numerous hidden areas to uncover. In Demon’s Crest, every level is essentially two levels compressed into one, with a direct path leading to the level’s end boss and progress to the next level, and an alternate path leading to a separate boss, with no small number of miniboss encounters in between. 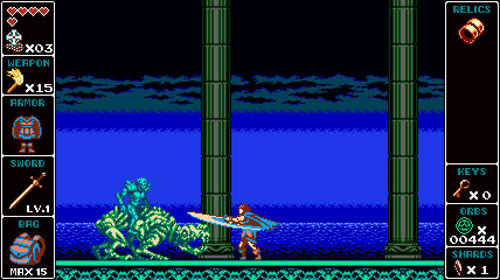 Odallus is very similar in this regard, with some levels containing more than one boss, and several minibosses along the way, many of which are hidden behind large level branches that may only be accessed by using sub-weapons or new movement abilities. 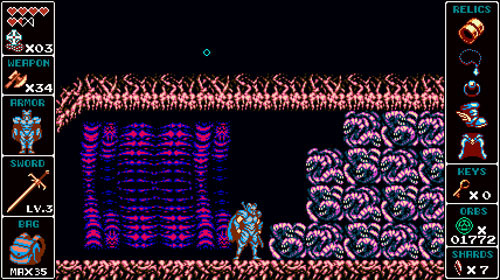 In addition, Odallus offers entirely new levels that can only be accessed by finding alternate branching paths. 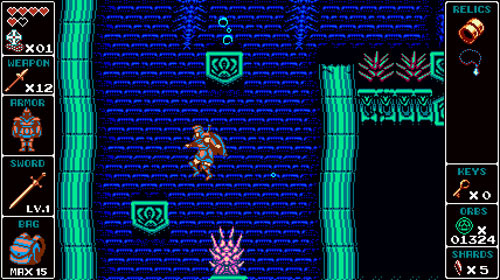 There are four levels along the “main” path, as shown on a Ghosts ’n Goblins-style overworld map. There are four additional levels that can only be accessed from within those levels. 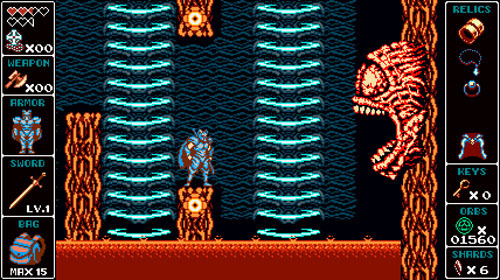 And, unlike Demon’s Crest, the player must complete every level before he is able to enter the last area and confront the final boss. Haggis begins the game with a ledge grab, a 2x variable jump, and a sword attack with a fairly short range, requiring that he get up close to his enemies. A few enemies die in a single hit, but more often, Haggis must strike enemies several times before they fall. As such, players must take a more tactical approach to combat by ducking to strike low and avoid enemy attacks, attacking and backing away, and moving in quickly to strike with the proper timing. Enemies come in a number of forms with varying strengths and weaknesses, and Haggis can’t take much damage before he falls. There are weak flying enemies that move quickly, crossbow enemies that fire from a distance but pause after every three shots to reload, and large enemies that can soak up a lot of damage and unleash some powerful strikes that knock you back. Lots of enemies toss projectiles, requiring the player to time his moves properly in order to close in and strike. Some enemies are more susceptible to certain sub-weapons, allowing players to strike from afar and even damage certain shielded enemies. Early on, Haggis gains access to three sub-weapons: an axe, a torch, and a spear. Haggis can only carry 10 of each weapon, but he may stockpile them and cycle between each of the weapon types. 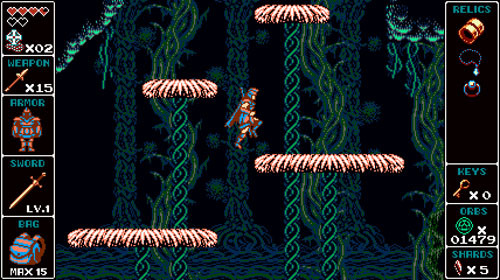 Sub-weapons are assigned to a single button press, as opposed to pressing UP and ATTACK as in the Castlevania games, and in the developer’s previous title, Oniken. The axe flies in a straight line to hit enemies at a distance, but it also bounces off of solid objects, potentially causing additional damage to enemies up against a wall. 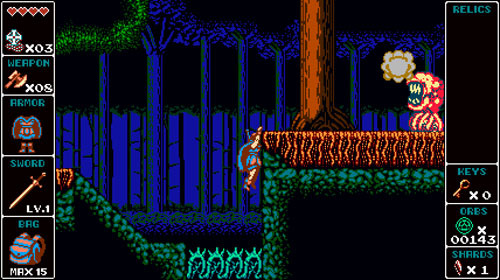 The torch is tossed at a downward angle, making it more difficult to line up a target; however, it causes more damage than the axe and it explodes to cause continuous damage to enemies with a well-placed throw, working similarly to the holy water sub-weapon in the Castlevania series. The torch can also be used to melt ice blocks and access hidden areas. Lastly, there is the spear, which has a very unusual arc, in that it flies high into the air, and then drops down quickly, giving it a short range. However, it is a strong weapon and its odd arc allows players to strike enemies above and below, and even break blocks in the floor, which are impervious to the player’s starting weapon. By thoroughly searching the environment, players can find weapon bags that increase their carrying capacity to a maximum of 50 sub-weapons, although these bags are fairly well hidden. Other hidden items include expository rune stones and permanent health upgrades in the form of hearts, each adding a half heart to the life meter when collected. The player begins the game with four hearts and can reach a maximum of eight. Of equal importance are sword and armor upgrades, which may only be found by thoroughly exploring the environment. One sword upgrade allows for faster strikes, while another retains this speed while also increasing its strength. The first armor upgrade reduces damage taken by enemies, while the second – which is much more difficult to earn – allows for a trio of powerful special attacks that are incredibly useful during boss encounters. Lastly, players may find money and 1UP talismans hidden in corners, behind false walls, and on out-of-the-way platforms. Currency comes in the form of soul orbs, with green orbs worth a single unit, blue worth five, and red worth 30. Blue and red orbs are most commonly found in blue and red treasure chests, respectively, while all orb denominations are found as occasional enemy drops, with higher values dropping from greater foes. Currency may be spent on health restoratives and sub-weapons – and the prices go up with each purchase – although these items also appear in yellow treasure chests spread around the environment. Unlike red and blue chests which may only be opened once, yellow chests are restocked each time the player enters the level, making merchants more of a convenience. 1UP talismans are also available for purchase, although the player has infinite continues and is returned to the world map with three lives upon death. 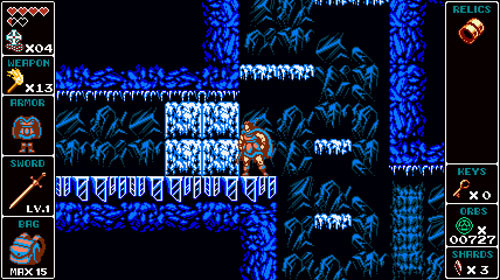 1UPs essentially act as another opportunity to complete a level without having to restart it, which may be useful if the player is having difficulty with a boss encounter, but otherwise, all of the player’s progress is retained upon death... Unlocked doors remain open, treasure remains collected, and special items and ability upgrades remain in the player’s possession as well (though tossed sub-weapons are lost), making the presence of 1UPs somewhat unnecessary. 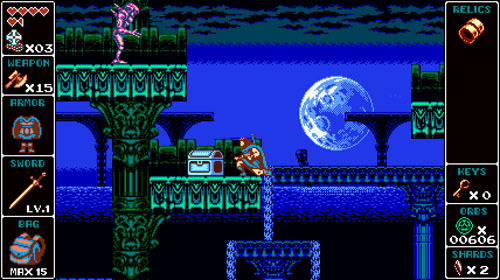 Per metroidvania standards, there are a number of ability upgrades that allow players to revisit previous areas and access new routes. Upgrades include the ability to breathe underwater (prior to which, the player has a 5-second countdown timer), push heavy blocks, dash, glide for long distances, and double jump. Dashing, gliding, and double jumping may be combined for some long distance aerobatics, allowing players to cover ground quickly and avoid a number of enemies, which makes it easier to revisit previous areas. As mentioned, level designs are very open, with a number of branching paths, and often a great deal of verticality. 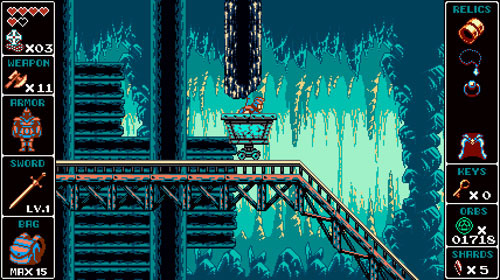 In addition, a number of environmental challenges affect navigation, such as large underwater areas where the player moves slowly and can jump much higher, as well as mountainous areas where the ground is slick and blowing wind pushes the player around, making it difficult to line up jumps and retain steady footing on narrow platforms. 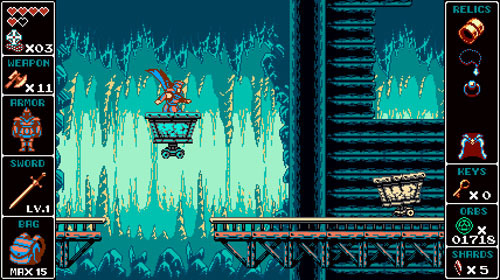 There is also a lengthy mine cart sequence (once considered “obligatory” in the platforming genre), requiring players to mount a number of carts that speed along a set path. Per mine cart conventions, players must jump over obstructions and gaps in the track, and duck under low overhangs. Players can also find a couple of branching paths along the track that lead to permanent upgrades. Unfortunately, much of the players progress in mine cart sections comes down to trial and error, as it is difficult to react to upcoming dangers given the uncontrollably fast movement speed, especially in areas where the player must jump out of the cart to flip switches and open doors blocking the track. Crashing or falling off the track results in a small health loss and places the player at the last checkpoint, requiring that he complete the sequence again. 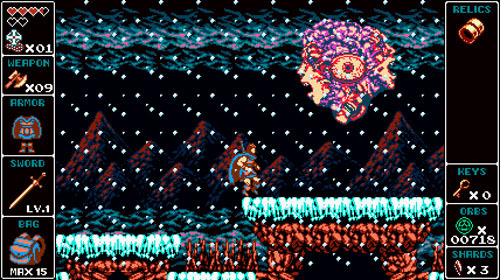 Throughout the game, the player faces off against a number of grotesque bosses, most of which are preceded by short dialogue sequences. Bosses are often comprised of misshapen masses of bone and flesh, with exposed organs and slime spewing forth as they take damage. Bosses tend to be fairly mobile but don’t take many strikes to destroy, although the player does occasionally encounter less mobile creatures that absorb a ton of damage, leading to some grueling encounters where players need to dodge a barrage of attacks and wait for the right moment to strike. Once a boss has been killed, players are free to revisit the area without needing to face it again. 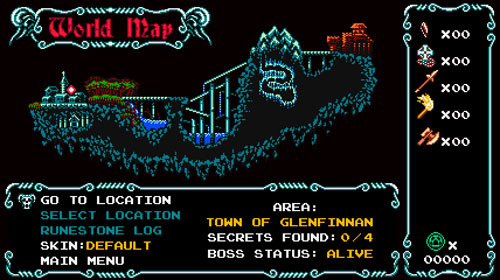 The world map shows whether the area's boss has been slain and also indicates how many secrets remain to be found in the level, allowing players to direct their exploration productively. Completion percentage is tracked, and an extended ending sequence is available to those who have thoroughly explored the world. 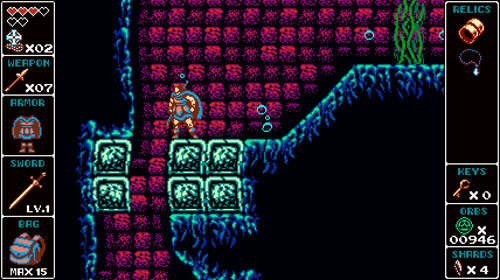 Aesthetically, the game retains much of the flavor found in NES games, particularly in regards to limitations in the color palette, as most enemies and tiles are comprised of 4-color sprites. 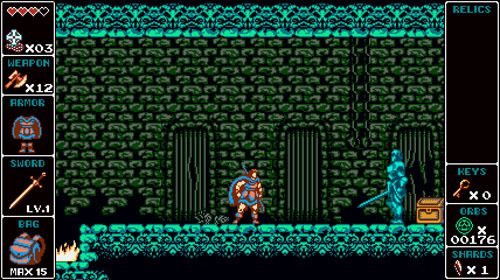 However, the game is presented at a much higher resolution than the NES was capable of, in addition to featuring more detailed animations, some parallax effects, and the absence of sprite flicker. Also, to make the most use of screen real estate – and to prevent the player from constantly needing to access a menu – all weapons, items, and counts are presented on the left and right edges of the screen. 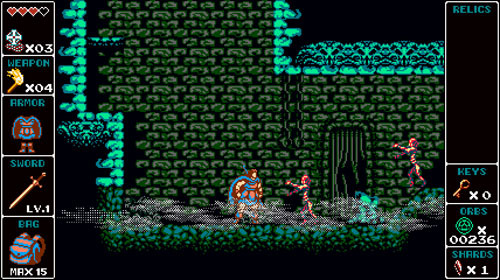 Odallus: The Dark Call was developed by Joymasher, a studio founded in 2012 by Danilo Dias, Thais Weiller, and Marco Galvão, and based in Sao Paulo, Brazil. Music for the game was composed by Tiago “Serenati” Santos. The studio is most known for their retro action game Oniken (and our 2012 Game of the Year) which mixes elements of classic 8-bit action games like Contra and Ninja Gaiden. The studio has also created a number of freeware games, including MRC6-454, Major Maox, and Sigurdr's Havoc. 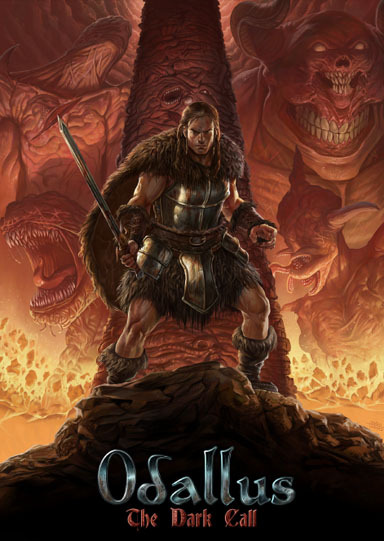 Odallus was funded in part by a successful Indiegogo campaign.